Is your finance organization knee deep in spreadsheets for monitoring and analyzing financial and business performance? 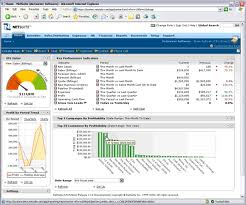 NetSuite delivers built-in, real-time financial dashboards, reporting and analytics that allow you to continually monitor personalized key performance indicators (KPIs) and get access to the latest management and financial reports. Diagnose financial issues on the fly with drill-down visibility to customer, employee or transactional details—and quickly take action to drive business performance. Gain visibility into business performance from summaries down to the actual live transaction. Provide all team members with access to the latest information—including reminders about required daily tasks, such as viewing overdue invoices or accepting payments—as part of their day-to-day activities. For example, drill down from days sales outstanding (DSO) measures to an aging report and then to the underlying invoice and customer information—all with only a few clicks. Easily email, share or export reports to formats such as PDF, Excel or Word. Easily select the subject area and lay out your report, then share it with colleagues or add it to your daily dashboard. Enable your extended finance team to get the latest financial and operational measures around business performance, from the CEO on the road to a geographically distributed board of directors. Identify variances between your plan and actuals, isolate the organization and account responsible for the variance and drill into the transactions contributing to the variance.